Global engineering group Cavotec has won five separate orders with a combined value of more than €9 million for some of its key innovative technologies, including the Group’s MoorMasterTM automated mooring system and the new Automatic Plug-in System (APS), highlighting the strength and diversity of Cavotec’s portfolio. “These orders demonstrate how Cavotec continues to expand its presence in the global port equipment sector. MoorMasterTM is one of our leading technologies and its continuing success at the Port of Salalah in Oman, and at other ports around world, underlines the great potential of the system,” says Ottonel Popesco, Cavotec CEO. The largest of these orders is for a number of MoorMasterTM MM400E automated mooring units at the Port of Salalah in Oman, which are to be installed at one of the port’s container berths. The order is the latest in a long series of MoorMasterTM projects at the Port of Salalah, where the technology first went into operation in 2006. MoorMasterTM is a vacuum-based automated mooring technology that eliminates the need for conventional mooring lines. 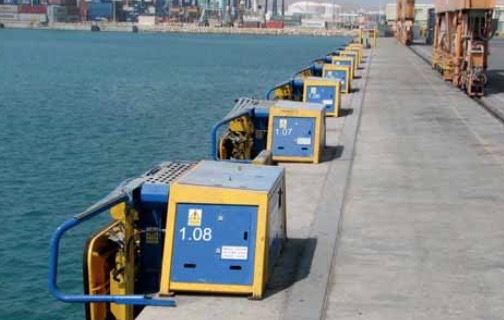 Remote- controlled vacuum pads recessed in, or mounted on the quayside or pontoons, moor and release vessels in seconds. To date, some 200 MoorMasterTM units have been installed at 28 locations worldwide and have completed more than 130,000 mooring operations at ro/ro, container and bulk handling, and lock applications. Elsewhere, a major crane manufacturer has placed a substantial order for Cavotec’s APS units for installation on 16 Electric Rubber Tyred Gantry (ERTG) cranes, and a large number of yard connection points for a port in India. In addition to the manufacture and supply of this equipment, Cavotec will also be supporting the customer with on site supervision and commissioning. “We’re especially pleased about the APS project: APS is one of our newer technologies, and this order indicates the potential it, and our other innovations, have in the market place,” says Luciano Corbetta, Group Market Unit Manager, Ports & Maritime. In a separate development, Cavotec has also been awarded contracts to supply its MoorMaster systems for applications in Australia, Canada and the United States, with a combined value of approximately €6.5 million. Seaway. The units are scheduled for delivery for the first lock in July 2016, and the second lock in April the following year. MoorMasterTM units have been in operation at the Seaway for a number of years, and Cavotec is currently completing installation of 39 MoorMasterTM MM400L (Lock) units in all 13 of the locks on the Canadian side of the waterway. These specially adapted units hold vessels securely through variations in water level of up to 14m. The St. Lawrence is the world's first inland waterway to introduce automated mooring. Work began on installing the first MoorMasterTM units at the St. Lawrence, on a trial basis, at two locks in 2007. “We have worked closely with the St. Lawrence Seaway for many years, and together we have been able to realize substantial operational efficiencies through the implementation of MoorMasterTM,” says Marcelo Gonzalez, Managing Director of Cavotec Canada. Considered to be one of the greatest engineering feats of the 20th century, the 3,700km-long Seaway is an essential trade link between the Atlantic Ocean and the Great Lakes at the heart of North America. And in Newfoundland, eastern Canada, Cavotec has won a contract for four MoorMasterTM MM400E10 units for the Portugal Cove – Bell Island passenger ferry service. Two units will be installed at the Portugal Cove Dock and two at the Bell Island Dock. The third order has been placed by SeaRoad Holdings a leading Australian transport and logistics provider. SeaRoad Holdings has purchased two additional MoorMasterTM MM400A10 units to supplement their existing installations in Devonport in Melbourne. This brings the mooring capacity to five MM400s at each berth to cater for a larger ro/ro vessel being introduced on the route between Melbourne and Tasmania. Additionally, SeaRoad is working with Cavotec’s After Sales and Service department to project manage and overhaul the existing units without disruption to operations. These existing units have been in continuous service since 2003 and have accumulated more than 35,000 hours of mooring at each berth.